Making sure you stick to a healthy diet can sometimes seem a bit overwhelming, but it certainly doesn’t have to be boring or tasteless! Including whole grains as part of a healthy, balanced diet is a great way to make sure you get enough fibre, which is important for maintaining a healthy digestion system. We digest whole grain food more slowly so it can help us feel full for longer. And the great news is that a healthy, balanced diet with satisfying whole grains can be surprisingly tasty! This recipe really does prove that salads aren’t just for summer. The Chipotle Chicken from Delicious has a lovely warming kick to it and the delicious quinoa adds a nutty texture and flavour. 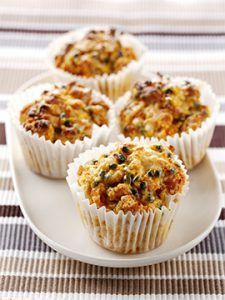 For a tasty treat try these whole grain muffins. They’re best served warm on the day you bake them, but also freeze very well for defrosting and icing at a later date! Who said you shouldn’t eat pizza? 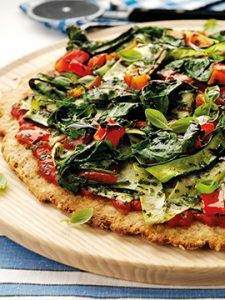 This delicious scone pizza contains 2 of your 5 a day, and includes whole grain. Sprinkle some grated light mozzarella on top before cooking. 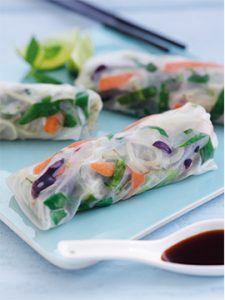 These spring rolls make an exceptionally zingy and fresh lunch, that’s also low in fat! For a vegetarian version just swap the chicken for tofu, or just use shredded lettuce and spring onion, or prawns if you eat fish. This dinner from Jamie Oliver is high in protein and under 500 calories. The mussels are nutritious and contain iodine and selenium, and the wholegrain toast means you’re getting fibre too! End your day with delicious baked apples with an oat and pecan crumble topping (not suitable if you have a nut allergy). These are so tasty and easy to make, and it means you’re getting one of your 5-a-day in a dessert!